The life of the Pines Theater began on September 9, 1925. Following speeches from local prominent businessmen E.L. Kurth, Kester Denman, I.A. Coston, and I.D. Fairchild, movie-goers were treated to the theater's first movie, Coast of Folly starring Gloria Swanson. Organ music was provided by Willie Frazier, who also sold tickets at the theater. The average cost of an afternoon spent in the cool dark enjoying a movie was about 25 cents. The Lufkin Amusement Company, which later became East Texas Theaters, was the first owner and the first manager was Non Binion. In 1981, the Pines’ last manager, Ray Pike, had the facility refurbished. These were to be the last updates to the theater until it was sold by owner Elliot Cavanaugh in 1984 to use as a house of worship for the Covenant of Love Outreach. The theater was listed on the National Registry of Historic Places in 1988. It continued as a church until approximately 2005 and then remained vacant until 2007, when the City of Lufkin purchased the theater. 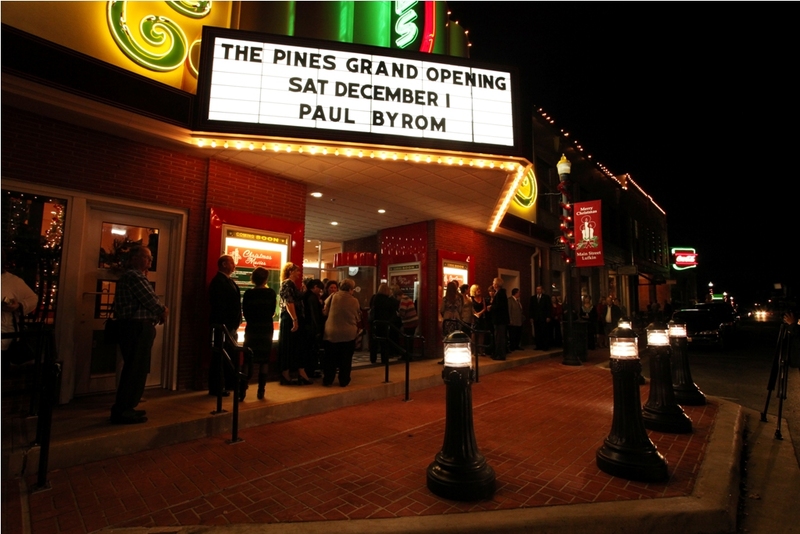 Today, the art-deco charm and beauty of the original Pines Theater has been brought back to life. Following years of community input, staff research, demolition and reconstruction, The Pines Theater is once again the focus and heart of Lufkin's flourishing downtown district. SHOW-STOPPING ENTERTAINMENT FOR ALL OF EAST TEXAS!